Hounslow Council’s foster carers have been recognised once again for their commitment they show to the borough’s children in care. 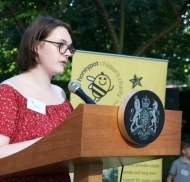 On 19 November, the Mayor of London launched a £20 million ‘Young Londoners’ fund to support more than 60,000 young people to fulfil their potential. Following the review of Hounslow Youth Service, young people in Hounslow will soon be able to benefit from the expertise of two new providers who have been commissioned to deliver youth activities. The 2 November deadline is fast approaching for Hounslow residents to have their say on their current childcare provision of their future childcare needs. On 25 February, the Home Office launched a £13 million ‘Trusted Relationships’ fund to help Local Authorities work with community organisations. Hounslow Council’s youth and community service has organised a packed programme of activities from sports to creative workshops for children and young people to enjoy. Hounslow foster carers who look after vulnerable children and young people are being offered a cut on their council tax payments. Launched in 2008, Hounslow’s Family Information Service (FIS) is celebrating its tenth anniversary. Foster Care Fortnight, Monday 14 - Sunday 27 May, is the UK’s biggest foster care awareness raising campaign, delivered by the leading fostering charity, The Fostering Network. Ofsted inspectors have found that Hounslow Council works successfully in partnership to identify and protect the borough’s most vulnerable young residents. Statement from Councillor Richard Foote, Cabinet Member for Communities, Hounslow Council. There is just a week to go to have your say on the future of youth services in the borough. Hounslow Council’s Children’s Services have welcomed a further four unaccompanied children from the refugee camps at Calais. Hounslow Children's Services has responded promptly to the first arrivals of unaccompanied children and young people from the refugee camps at Calais. During spring term 2016, Hounslow’s very own Educational Psychologists piloted the ELSA [Emotional Literacy Support Assistants] training.